Today’s Bible reading reminds us of a story we’ve all heard. And if you ever attended Vacation Bible School or a children’s Sunday School you’ve heard kids gleefully singing about it. The narrative contains many adult messages that we need to be reminded of. 1. We need to humbly seek Jesus with the excitement and curiosity of a little child. The Bible says there were large crowds surrounding Jesus as he passed through Jericho. Zacchaeus, who a wealthy tax collector, a man short in stature, couldn’t see. So he ran. Got ahead of the crowd. And climbed a tree. Why? To see Jesus. His child-like enthusiasm is a good quality for anyone desiring to really see Jesus. In fact, the Lord said, “Assuredly, I say to you, whoever does not receive the kingdom of God as a little child will by no means enter it’ (Lk. `8:17). “Curiosity and simplicity are a sort of preparation for faith,” observed one commentator. 2. Jesus took time for one obscure person. As was often the case during his ministry, Jesus stopped to talk to a single individual, even though there were multitudes of people around him. Jesus was on the way to Jerusalem. On the way to the cross. He was busy and focused. He had a lot on his mind. Yet, he wasn’t too busy for this sincere seeker. 3. 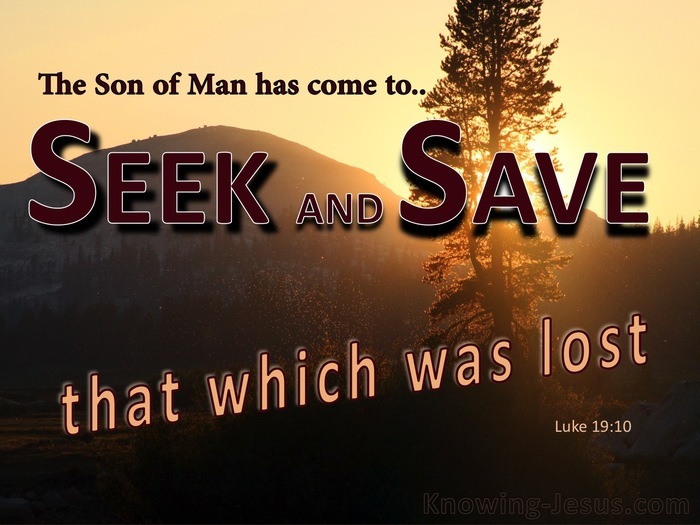 The story reminds us of why Jesus came to earth–to “seek and save the Lost. Ironically, Zacchaeus thought he was seeking Jesus, but in reality, Jesus was seeking Him. He actually went home and ate with Zacchaeus and his friends. I’m afraid this story puts many of us to shame. We enjoy fellowship with the saints. Worshiping. Singing. Listening to familiar Bible lessons. But associating with sinners is uncomfortable. Often challenging. And many times messy. In fact, we are sometimes ill at ease when a known sinner comes into our assembly, let alone going to their house to eat. Jesus is our example of personal evangelism. Of caring for the lost. The outcast. The despised of society. 4. Coming to Christ requires a change of heart and behavior. That’s what repentance is. A change of mind that results in a change of life. It calls for commitment. Correction. And conversion. Even, when possible, restitution. This wonderful, familiar story, reminds us that Jesus is seeking sinners–like you and I. All are welcome into His family. But discipleship challenges us to be different from the world. To ignore the critics. And faithfully follow Him. Even to minister to the outcast of society. Come down out the tree. Follow Jesus. And discover the joy He will bring to your life.